HA! Wow. Two beauty product posts in a row. That's something new for me. My beauty regime usually consists of black liner, that clinique 3 step thing that isn't really working for me and the latest CK scent. But after my internship at Viva when they left me with a huge haul of beauty closet goodies, I started getting really experimental. 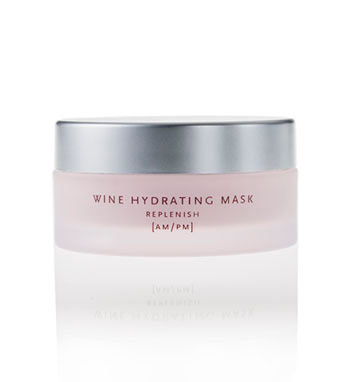 My friend T-Mac left Panda a cute little bag of girlie freebies to give me and I came across this Wine Hydrating Mask thing by Arcona, which, (after only 3 uses, I admit) I really don't think is doing anything to improve my looks, but it makes me smell like Sangria!!! And I love Sangria!!! I'm hoping the tiny freebie pot I have is a sample and it's not actually that size and going for $38 because I think I might stock up to take back home. I mean, I'm sure that if it claims to do all these things that it'll enhance at least one aspect of my unimpressive skin (which, for some reason, all of my friends on facebook have been saying is radiant lately). LOL oh yeah! thanks Sal. I think I'll buy a tub then. WHO NEEDS MONEY WHEN YOU LOOK LIKE THAT?